Happy Birthday! To you, to you friend! 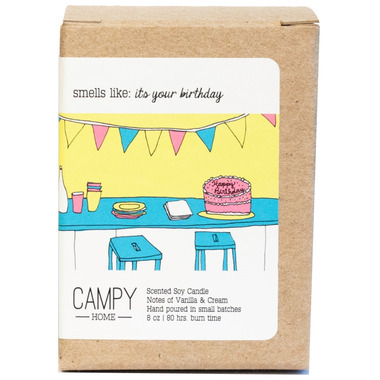 This Campy candle is a delicious blend of vanilla and cream, with sprinkles on top. Campy 8 oz soy candles are hand-poured in Almonte, Ontario, Canada. Each candle is a blend of essential and fragrance oil for fantastic, subtle scent that won't overwhelm the room. Smells exactly like it says! It's so good. Absolutely love this brand! The campy candles are locally made which I love by an adorable aspiring artist I had the pleasure of meeting at the One Of A Kind Show! The candles have amazing scents which are all powerful but not "over-powering". The perfect balance! I love this scent particularly because it has adorable little sprinkles on top! 10/10 smells like an actual birthday cake! Smells delicious! Sweet and vanilla-y with cute sprinkles on top!